Reindeer / Caribou at the Combines... Scout These Champs! REINDEER / CARIBOU @ THE ATHLETIC "COMBINES"
The largest reindeer grow up to four feet at the withers (top of shoulders) and 250 pounds. Each reindeer can pull approximately twice its own weight, making it an ideal animal pulling equipment wagons onto the field, and pushing back defensive linemen. As great as they are individually, they are even greater in harness; a team of eight can move about 2 tons off the line. That's a lot of "Bubbas," "Refrigerators," and "Hacksaws!" 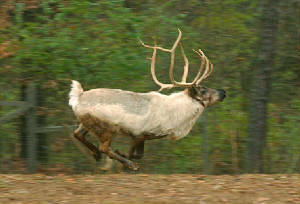 The reindeer's unharnessed running prowess is without question: It can boogie at speeds of well over 30 mph. Its compact, power-packed size makes the speedier ones ideal candidates for running backs. Further, it's a competitive creature against which even "speed merchant" big cats... such as the Princeton Tiger... would struggle, especially in snow because this athlete is built "Big Green Tough" for winter conditions! Off the field, reindeer fit well into the community, often making appearances in malls and at events. Like supermodels and superstars, they are usually called-out by single name. Cars have even been named after some... think "Dasher." Both males and females have great looking antler racks making them a sure hit with kids, crowds, and licensed merchandisers alike; yet, get this... neither have ever been selected as a mascot by a professional sports team, or a known college team. Truth be told, googling could only find a soccer team in India with the name, though one suspects that it is used in northern regions where websites aren't currently being built. Since reindeer are also called caribou (nuances exist)... "The Big Green Bou" could carry The College's traditional name with a definite ring for our teams' "fight" moniker and mascot name. And when Dartmouth sweeps the Ivy and other titles, all will know that The Big Green Bous are truly the "Reigning Dartmouth Deer!" Ladies and Gents of Dartmouth, this is the franchise creature for which we've been searching. Our 30 year quest is over! Reindeer have large, round, split-toed hooves which are both effective in scraping snow and preventing it from sinking into the snow. They are also effective paddles when swimming. Hair tufts between the toes protect the hoof when walking on ice and snow. Reindeer have a double coat; a thick undercoat, and an overcoat of hollow, air-filled hairs, which besides providing insulation, provides buoyancy in water so that one-third of its body is always above water when it swims. Although their vision and hearing is not the best, reindeer have a keen sense of smell. It should be noted that the Moose is no better in this regard.